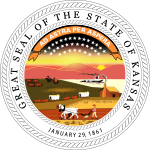 The 2018 Kansas gubernatorial election took place on November 6, 2018, to elect the next Governor of Kansas. Democratic nominee Laura Kelly was elected, defeating Republican nominee Kris Kobach and an independent candidate, Greg Orman. Republican Governor Sam Brownback was term-limited and could not seek reelection to a third consecutive term, but can re-enter as a candidate in 2022. On July 26, 2017, Brownback was nominated by President Donald Trump to serve as United States Ambassador-at-Large for International Religious Freedom. Brownback was confirmed by the United States Senate on January 24, 2018. On January 31, 2018 Brownback resigned the governorship and Lieutenant Governor Jeff Colyer succeeded him. Colyer was eligible to seek a full term and announced his candidacy prior to becoming Governor of Kansas. In the August 7 primary, Colyer ran against CPA and incumbent Insurance Commissioner Ken Selzer, Topeka doctor and 2006 Republican Kansas gubernatorial nominee Jim Barnett, and Kansas Secretary of State Kris Kobach. On August 7, 2018, Kobach defeated Colyer in the Republican gubernatorial primary by an initial margin of 191 votes, a lead that increased to 361 votes by August 14, although discrepancies in some counties needed resolution and provisional and absentee ballots may not have been counted in some counties. Colyer conceded the Republican nomination on August 14. Democratic State Senator Laura Kelly easily won the Democratic nomination. Independent Greg Orman, who finished second in the 2014 U.S. Senate race against incumbent Republican Pat Roberts, ran for governor, again as an independent candidate. Given that Kansas is the only state which has no gubernatorial statutory qualifications whatsoever in its constitution, seven teenagers, including one who has never even been to the state of Kansas, ran for the office in this election cycle. A debate took place on September 5 between the three candidates that consistently polled above 5%. Polls in late August had Kelly and Kobach running close with Orman polling in the single digits. Laura Kelly's win continued a streak of party turnover for Governor of Kansas, as Kansas has not elected two consecutive governors of the same party since Republican William Avery succeeded fellow Republican John Anderson Jr. following the 1964 election, and neither major party has held the governorship for longer than eight consecutive years since Republican John McCuish left office in 1957. Wink Hartman, businessman and candidate for KS-04 in 2010 (running for lieutenant governor) Hartman joined Kris Kobach's campaign as his Lieutenant Gubernatorial candidate. Lee Kinch, Former Kansas Democratic Party chairman. Tom Burroughs, Democratic member of the Kansas House of Representatives, formerly served as the House Minority Leader. Rep. Pam Curtis, D-32nd Dist. Rep. Stan Frownfelter, D-37th Dist. Rep. Broderick Henderson, D-35th Dist. Rep. Louis Ruiz, D-31st Dist. Rep. Cindy Neighbor, D-18th Dist. Rep. Adam Lusker, D-2nd Dist. Rep. Eber Phelps, D-111th Dist. Rep. Tom Sawyer, D-95th Dist. Rep. Jerry Stogsdill, D-21st Dist. ^ Sullivan, Sean; Zauzmer, Julie (January 24, 2018). "Pence forced to break tie over nomination of Brownback for religious freedom post". The Washington Post. Retrieved January 24, 2018. ^ Heilman, Nick Viviani and Matt. "Gov. Sam Brownback's last day in office is Jan. 31". Retrieved January 27, 2018. ^ Smith, Mitch; Fortin, Jacey (July 26, 2017). "Gov. Sam Brownback of Kansas Will Be Nominated as Religious Ambassador". The New York Times. Retrieved July 27, 2017. ^ "Unofficial Kansas Election Results". ent.sos.ks.gov. Retrieved August 9, 2018. ^ Woodall, Hunter; Vockrodt, Steve; Lowry, Bryan. "Kris Kobach continues to build his lead after Johnson County ballots tallied". Kansas City Star. Retrieved August 14, 2018. ^ Kris Kobach, Trump ally and Kan. secretary of state, recuses himself from vote counting in his own GOP primary vs. Gov. Jeff Colyer, The Washington Post, Amy B. Wang and Felicia Sonmez, August 9, 2018. Retrieved August 10, 2018. ^ Feuerborn, Mark (August 14, 2018). "Colyer concedes to Kobach a week after Kansas GOP primary". KSNT.com. Retrieved August 14, 2018. ^ [Live results for the Kansas primary elections Kris Kobach is challenging incumbent Jeff Colyer in the GOP primary for governor.<ref , Vox (website), Ella Nilsen and Li Zhou, August 7, 2018. Retrieved August 10, 2018. ^ Rucker, Philip (November 4, 2014). "Battle for the Senate: How the GOP did it". Washington Post. Retrieved August 9, 2018. ^ Woodall, Hunter (September 28, 2017). "As third teen joins Kansas governor race, consider this: No rule says a dog can't run". The Kansas City Star. Retrieved September 29, 2017. ^ Without a clear primary winner, the Kansas GOP might be at a disadvantage. The Washington Post. 10 August 2018. ^ Woodall, Hunter (March 21, 2018). "Kobach names Wichita businessman as running mate". Retrieved March 21, 2018. ^ Smith, Derek (June 20, 2017). "Barnett launches another run at Governor's office". Emporia Gazette. Retrieved June 20, 2017. ^ "Barnett names wife, Rosemary Hansen, as running mate in Kansas governor's race". LJWorld.com. Retrieved July 30, 2018. ^ Carpenter, Tim (February 14, 2018). "Gov. Jeff Colyer picks Tracey Mann, Salina businessman, as GOP lieutenant governor". Hays Daily News. Retrieved February 14, 2018. ^ "Patrick Kucera Announces". The Green Papers. Richard E. Berg-Andersson. Retrieved June 2, 2018. ^ "Patricia Reitz announces". The Green Papers. Richard E. Berg-Andersson. Retrieved June 2, 2018. ^ Lowry, Bryan (September 19, 2017). "Shawnee Mission high school student becomes second teen to join Kansas governor race". The Kansas City Star. Retrieved September 21, 2017. ^ Kite, Allison (August 7, 2017). "Kansas insurance commissioner enters governor's race". The Topeka Capital-Journal. Retrieved August 7, 2017. ^ Wilson, Bill (May 21, 2018). "Selzer tabs Goodland businesswoman for lieutenant governor". Wichita Business Journal. ^ Clarkin, Mary. "Fifth teen enters race for governor". The Hutchinson News. Retrieved October 26, 2017. ^ Salazar, Daniel (February 15, 2017). "Wink Hartman running for governor 'because it's time to fix Topeka'". The Wichita Eagle. Retrieved February 20, 2017. ^ Woodall, Hunter; Lowry, Bryan (February 21, 2018). "Wichita businessman drops campaign for governor, endorses Kobach". The Kansas City Star. Retrieved February 21, 2018. ^ Kautz, Lydia (July 10, 2018). "Longbine endorses Colyer". Emporia Gazette. ^ "Wisconsin's Walker endorses Kansas governor in primary race". APnews.com. Retrieved July 16, 2018. ^ Hancock, Peter. "Kansas Gov. Colyer picks up re-election endorsement from former candidate". LJWorld.com. Retrieved May 24, 2018. ^ Carpenter, Tim. "Former U.S. Senator Bob Dole endorses Jeff Colyer in Kansas governor's race". Retrieved July 30, 2018. ^ "Kansas Farm Bureau's Vote FBF Announces Endorsements for State and Federal Races". KFB.org. Retrieved July 16, 2018. ^ "The Latest: NRA Endorses Kansas Gov. Colyer in GOP Primary". nytimes.com. Retrieved July 16, 2018. ^ a b Lowry, Bryan; Woodall, Hunter (June 21, 2018). "Kobach jumps the gun on anti-abortion group's endorsement — which also goes to Colyer". kansascity.com. ^ Staff, Our. "Livestock group endorses Colyer". Retrieved July 30, 2018. ^ "Kansas State Trooper's Association endorses candidate for governor". WIBW. Retrieved July 16, 2018. ^ "Kansas Primary Election Results". Kansas Secretary of State. Retrieved August 18, 2018. ^ Carpenter, Tim (May 24, 2018). "Kelly selects Lynn Rogers as running mate". The Hutchinson News. ^ Lowry, Bryan (December 7, 2017). "Kansas Democrats face off in Johnson County ahead of high stakes race for governor". The Kansas City Star. Retrieved December 31, 2017. ^ a b Clarkin, Mary (August 6, 2017). "Kansas teens running on ticket for gov". The Hutchinson News. Retrieved August 7, 2017. ^ Lefler, Dion (February 20, 2017). "Former Wichita mayor announces run for governor". The Wichita Eagle. Retrieved February 20, 2017. ^ Shorman, Jonathan; Lefler, Dion (May 21, 2018). "Carl Brewer names another former mayor as running mate". The Wichita Eagle. ^ "Democrat Joshua Svaty declares candidacy for Kansas governor". Retrieved August 7, 2017. ^ Woodall, Hunter (May 9, 2018). "House Democratic leader ends run for Kansas governor". The Kansas City Star. Retrieved May 9, 2018. ^ Shorman, Jonathan; Woodall, Hunter (April 13, 2017). "Democrat Paul Davis begins bid for Congress, not governor". The Wichita Eagle. Retrieved April 17, 2017. ^ Rose, Steve (May 7, 2016). "Kris Kobach could be next governor of Sunflower State". The Kansas City Star. Retrieved July 8, 2016. ^ Hancock, Peter (August 22, 2015). "Paul Davis still a star in eyes of Kansas Democrats". Lawrence Journal-World. Retrieved July 8, 2016. ^ Helling, Dave (November 12, 2015). "Kansas Democrats see an opening, fear they can't take advantage". The Kansas City Star. Retrieved July 8, 2016. ^ a b Lowry, Bryan; Salazar, Daniel (January 27, 2017). "So, who could run for Kansas governor in 2018?". The Wichita Eagle. Retrieved January 27, 2017. ^ "Carlin stumps for Svaty in KCK". Wyandotte Daily. August 4, 2018. ^ Former GOP U.S. senator, Senate president among those choosing Kelly over Kobach, Kansas City Star, Hunter Woodall, September 13, 2018. Retrieved September 13, 2018. ^ "Endorsement guide: See who's backing the Kansas governor candidates". Wichita Eagle. August 6, 2018. ^ "Svaty visits KCK, picks up legislative endorsements". Wyandotte Daily. July 31, 2018. ^ a b c d e f g h i "Svaty visits KCK, picks up legislative endorsements". Welcome to Wyandotte Daily. August 1, 2018. ^ "Probst among those backing Svaty". Hutch News. July 31, 2018. ^ matthew.heilman. "Teens from outside of Kansas running for governor". Retrieved May 22, 2018. ^ a b Clarkin, Mary (December 27, 2017). "High school dropout running for governor". The Hutchinson News. Retrieved January 16, 2018. ^ Muckenfuss, Anna (March 18, 2018). "An App State Freshman Runs For Kansas Governor". Retrieved June 15, 2018. ^ "Former inmate who filed to run for Kansas governor is in jail again, charged with stealing diamonds - Lights & Sirens". LJWorld.com. Retrieved May 22, 2018. ^ Clarkin, Mary. "Former inmate running for governor". Retrieved May 22, 2018. ^ Lowry, Bryan (March 6, 2018). "Kansas lawmaker leaving Republican Party to join Orman's independent campaign". The Kansas City Star. Retrieved April 8, 2018. ^ "State of Kansas ex rel. Derek Schmidt, Attorney General v. Secretary of State" (PDF). April 10, 2018. Retrieved June 15, 2018. ^ "I am running for Governor of Kansas!". February 13, 2018. Retrieved June 15, 2018. ^ "Jared Rogers Runs for Governor". Retrieved June 5, 2018. ^ a b Clarkin, Mary (February 16, 2018). "Delaware college student seeks Kansas governor's office". Hutchinson News. Retrieved February 16, 2018. ^ Kite, Allison (February 15, 2018). "7th teen candidate for governor has never lived in Kansas". Topeka Capital Journal. Retrieved February 15, 2018. ^ Carpenter, Tim. "Twenty-year-old Topeka Libertarian launches bid for Kansas governor". Retrieved May 22, 2018. ^ "Thomas Padgett for Kansas". www.facebook.com. Retrieved April 1, 2018. ^ Clarkin, Mary (March 30, 2018). "Supreme candidate could enter A.G. race". The Hutchinson News. Retrieved April 17, 2018. ^ "Larry J. Sabato's Crystal Ball » 2018 Governor". www.centerforpolitics.org. Retrieved November 15, 2017. ^ "Politico Race Ratings". Politico. ^ "2018 Governor Elections: As November Nears, More Governors' Races Become Tossups". www.governing.com. Retrieved July 18, 2018. ^ "2018 Governor Forecast | FiveThirtyEight". FiveThirtyEight. Retrieved October 31, 2018. ^ a b c d e f g h i j k l m n o p q r s t u v w x "27 prominent Republicans join the Republicans for Laura Kelly movement | Laura Kelly for Governor". www.laurakellyforkansas.com. Laura Kelly for Kansas. September 13, 2018. ^ Woodall, Hunter (September 18, 2018). "GOP stalwart Nancy Kassebaum picks Democrat Laura Kelly over Kris Kobach". www.kansascity.com/. The Kansas City Star. ^ Laura Kelly. "Thank you @KansasDems for putting together a great Demofest, and thank you @amyklobuchar and @TerryMcAuliffe for attending. You could feel the energy and excitement in the room - everyone is ready to get to work and win this November! #ksleg". Twitter. ^ Staff, Associated Press, 41 Action News (July 18, 2018). "Kansas GOP senator loses post on panel for backing Democrats". KSHB. ^ Koranda, Stephen (October 18, 2018). "Brownback Only Living Kansas Governor Yet To Endorse In 2018 Election". KMUW. ^ Paul Davis. "#FollowFriday & #FBF in one! I'm proud to be on the ballot w/ friend, former #ksleg colleague & future #ksgov @SenatorKelly! She shares my dedication to #ksed - a constant ally in #kssen fighting #Brownback cuts. This was taken when we received the 2014 Friend of Education Award". Twitter. ^ Hall, Erika (May 10, 2018). "Kansas budget expert endorses Senator Laura Kelly for governor". WIBW 13. ^ "Bill Graves endures Laura Kelly in Kansas Governor's race". Topeka Capital-Journal. September 4, 2018. ^ a b "Another former GOP governor of Kansas just endorsed Dem Laura Kelly over Kris Kobach". The Kansas City Star. October 18, 2018. ^ Shorman, Jonathan (October 30, 2018). "Orman treasurer resigns, endorses Kelly in Kansas governor race". kansas. ^ "Sebelius endorses state senator in Kansas governor's race". Lawrence Journal-World. March 4, 2018. ^ Terry McAuliffe. "First stop in Kansas is an event to support gubernatorial candidate @SenatorKelly with my good friend Senator @amyklobuchar". Twitter. ^ Eric Holder. "Republicans keeping people away from the polls in North Dakota, Georgia — and now Kansas. They are afraid of the people they claim they want to represent. In Kansas vote for Laura Kelly for Governor. @SenatorKelly Reject partisan unfairness and its leader Kobach". Twitter. ^ "Primary Election August 7, 2018 Recommended Candidates" (PDF). AFT-Kansas. Committee on Political Education of AFT-Kansas. ^ "Kansas General Endorsements 2018 - Local Union 124". Local Union 124. International Brotherhood of Electrical Workers. September 21, 2018. ^ Shorman, Jonathan (October 19, 2018). "Kobach or Kelly? Firefighter, police groups support different candidates". kansas. the Wichita Eagle. ^ "KNEA Recommended Candidates | 2018 General Election". files.acrobat.com. Kansas National Education Association. August 27, 2018. ^ "2018 KS AFL-CIO ENDORSEMENTS". Kansas State AFL-CIO. July 19, 2018. ^ Kelly, Laura; Missouri Kansas Alliance of Teamsters (September 15, 2018). "I am very proud to have the support of the Missouri Kansas Alliance of Teamsters, who represent over five thousand working men and women in Kansas. #ksleg". www.facebook.com. Teamsters Local 696. ^ "Kansas - Education Votes". Education Votes. ^ "2018 KS Primary Endorsements". The St. Louis - Kansas City Carpenters Regional Council. ^ "Kansas – Official UAW Endorsements". uawendorsements.org. ^ Ramirez, Emil; Juarez, Jody (May 22, 2018). "USW Endorses Laura Kelly for Kansas Governor". United Steelworkers. ^ Schriock, Stephanie (May 3, 2018). "EMILY's List Endorses Laura Kelly for Governor of Kansas". www.emilyslist.org. ^ Lubow, Craig (September 14, 2018). "PRESS RELEASE: SIERRA CLUB ENDORSES LAURA KELLY - Kansas Sierra Club" (PDF). Kansas Sierra Club. ^ "The Star endorses the one clear choice for Kansas governor". kansascity. The Kansas City Star. October 31, 2018. ^ Board, The Editorial Advisory (August 4, 2018). "Editorial: For Democrats, Laura Kelly is experienced choice". The Topeka Capital. the Editorial Advisory Board. ^ "The Eagle's endorsement for the Democratic gubernatorial primary". Wichita Eagle Editorial Board. The Wichita Eagle. July 29, 2018. ^ Kris W. Kobach. "It was my honor to work with former Attorney General John Ashcroft at the Justice Department to secure our country. Thank you General Ashcroft for your support of my campaign. You can watch the video here. #ksleg #ksgov". Twitter. ^ Kris W. Kobach. "Thank you Rep. @RonEstesKS for your endorsement! You've worked hard as state treasurer & in Congress to return money to taxpayers, including with the Trump tax cuts. We share the same Kansas values and I look forward to working with you so we can grow Kansas. #ksleg #ksgov". Twitter. ^ Kris W. Kobach. "Sen. Pat Roberts is a fighter for Kansas families and farmers and I am honored to have his endorsement. He knows it is important for KS to have a governor who will work with President Trump to make KS an affordable place to do business, create jobs & raise a family. #ksleg #ksgov". Twitter. ^ Ryan, Courtney (July 25, 2018). "Senate leaders weigh in on Kansas governor's race". KSN.com. ^ Shorman, Jonathan (May 16, 2018). "Kobach campaign shake-up: Consultant, aide are out as race intensifies". The Wichita Eagle. ^ Kris W. Kobach. "Thank you Goodland Mayor Brian Linin for your endorsement today during the #RemainRed bus tour stop in Goodland. You have positioned Goodland for long term success and I look forward to working with you as governor! #ksleg #ksgov". Twitter. ^ Dulle, Brian (November 8, 2017). "Fox News' Sean Hannity endorses Kobach for Kansas governor". KSNT. Retrieved November 10, 2017. ^ Woodall, Hunter (October 16, 2017). "Donald Trump Jr. coming to Kansas to campaign for Kobach". The Kansas City Star. Retrieved November 10, 2017. ^ "Ann Coulter on Twitter". Twitter. Retrieved May 24, 2018. ^ Starling, Nick (June 24, 2018). "Ted Nugent campaigns with KS Gov candidate Kris Kobach". Retrieved July 30, 2018. ^ Kris W. Kobach. "America's Toughest Sheriff, Joe Arpaio, endorses #TeamKobach. #ksleg #ksgov". Twitter. ^ Kite, Allison (August 31, 2018). "Kris Kobach wins support from labor union that previously backed Democrats". The Kansas City Star. ^ "NRA Endorses Kobach for Kansas Governor". NRA-ILA. September 21, 2018. ^ "KANSAS CHAMBER PAC ENDORSES IN GOVERNOR AND ATTORNEY GENERAL RACES". Kansas Chamber.